You might remember B1’s water-walking miracle experience at Dartmoor’s very dry Fernworthy Reservoir last year, well according to (the most excellent fun) OS Maps I too have now experienced my own (shared with a friend) liquid perambulation. 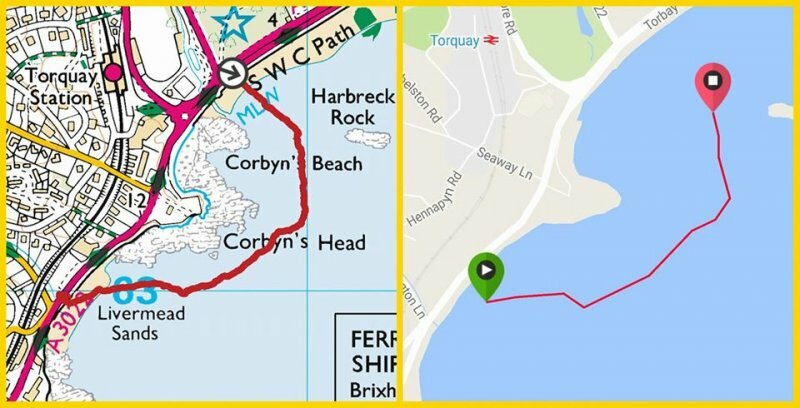 If you look carefully you will see that my good friend Gill and I trotted (or maybe we swam) all the round the Torbay headland known as Corbyn Head. We swam for around 40 minutes (it was chilly), covered 800 metres (I probably did more because I kept swimming in the wrong direction) and burnt a number of calories (enough to make me want an immediate lunch afterwards). There are two traces because Gill was wearing a clever bit of wearable technology on her wrist whilst towing a bright orange, floating tow bag which contained her very dry phone. The phone by the way was happy because it was serving a useful purpose and acting as our virtual lifeguard. One of the highlights for me was passing two buoys which had specific ‘Do Not Anchor’ messages on them. 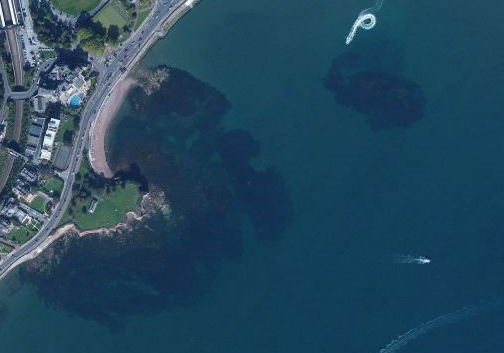 They were designed to encouraged people to protect the seagrass which grows in the sand and is just beautiful. We, being obedient young ladies, didn’t anchor. I will write a post about seagrass another day because I have so much to say about it. It is truly beautiful. I didn’t get a photo of the buoys anyway which means I am going to have to go back sometime and face the triffids again! NOTE TO SELF: Find out if there is such a thing as an underwater compass. That’s a big chunk of map. Training seems to be going well! Wish I had done more sea swimming/snorkelling when I still could. Should have thought that most liquid-filled compasses ought to be waterproof as standard, at least as far as surface swimming goes. Could you put one of your compasses in a transparent waterproof bag – such as one made for a phone?